This work would not have been possible without the enormous contribution of the NanoHive@Home participants, composed of over 6,000 worldwide volunteers and their computers. For those that were part of the NHAH community and want to see what the final work looks like, please drop me a line [nhah@somewhereville.com] so we can properly settle up. The results of a combined molecular dynamics/quantum chemistry pathology study of previously reported organic (diamondoid) tooltips for diamondoid mechanosynthesis (DMS) are presented. This study, employing the NanoHive@Home (NH@H) distributed computing project, produced 80,000 tooltip geometries used in 200,000 calculations optimized at either the RHF/3-21G or RHF/STO-3G levels of theory based on geometries obtained from high-energy molecular dynamics simulations to produce highly deformed starting geometries. These 200,000 calculations have been catalogued, grouped according to energies and geometries, and analyzed to consider potentially accessible defect structures (pathologies) for tooltip geometries either binding a carbon dimer (C2) feedstock or not containing the transported dimer feedstock. The transport and deposition of feedstock and the stability of the tooltip between dimer “loading” cycles are important geometries that must be considered as part of a tooltip stability analysis. The NH@H framework is found to be a useful method both for the study of highly deforming covalent geometries and, using lower-temperature MD simulations, for generating and optimizing molecular conformations (demonstrated using biotin, n-heptane, and n-octane in this study). The results of the pathology survey are discussed and general considerations for the exploration of DMS tooltip usability are explored. The tooltips themselves used for the deposition of carbon dimers were hammered on by the Q-SMAKAS (Quantum Search for Minimum Alternatives in Kinetically-Accessible Space) methodology (no, that wasn’t easy to make up), producing possible defect structures to explore how these tips might fall apart in an experimental apparatus. These tips were taken from the original survey paper [R. A. Freitas Jr., D. G. Allis and R. C. Merkle, “Horizontal Ge-Substituted Polymantane-Based C2 Dimer Placement Tooltip Motifs for Diamond Mechanosynthesis,” J. Comput. Theor. Nanosci. 4, 433 (2007)] and the DC10c study [D. G. Allis and K. E. Drexler, “Design and Analysis of a Molecular Tool for Carbon Transfer in Mechanosynthesis,” J. Comput. Theor. Nanosci. 2, 45 (2005) – and this one’s available as a free download from HERE]. Much to my surprise, there’s a section of a book available for background on google: Tip-Based Nanofabrication: Fundamentals and Applications, by Ampere A. Tseng. Tip conformation survey. Click on the image for a larger version. Biotin conformation survey. Click on the image for a larger version. Any stabilizing interactions within the open tooltip may serve to increase the barriers to structural rearrangement, H migration, etc. 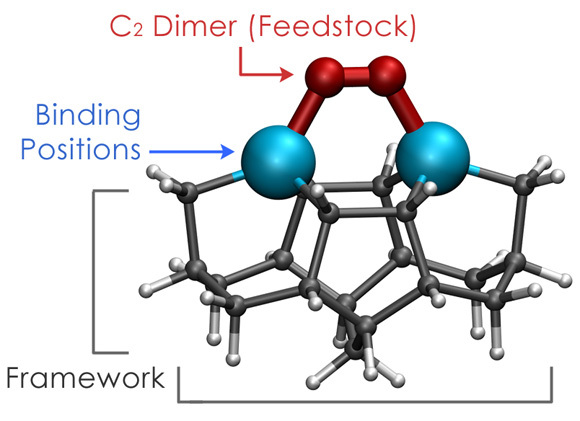 between the time a C2 dimer is deposited on a workpiece and the time the tooltip is recharged with a new C2 dimer. The identification of a more stable structure does not provide any insight into the energy barrier over which an operational mechanosynthetic geometry must pass in order to convert into a non-operational geometry. Identifying from among the failure modes within some energy range which of the operational tooltip structures that are accessible within a thermal regime in a working system is a time-consuming but very important subsequent step in any continued developmental survey of these tooltips. These largely-ignored tooltip pathologies are the results of hydrogen inversion, a type of defect that finds one or more H atoms inserting into the cage framework as a result of a methodological mismatch of atom momentum and classical time step in the MD simulations … Three common workarounds for large H atom displacements per time step are (1) the use of smaller time steps to recalculate the forces on the H atoms, (2) the artificial increase of the mass of the H atoms to reduce their net displacement over some set time step (such as re-massing H atoms to deuterium or higher), and (3) the subsuming of the H atoms into the associated “heavy” atom to remove the H motion entirely from the simulation. The NH@H tooltip pathology survey generated a considerable amount of data and, after the analysis of the resulting data, yielded a selection of tooltip pathologies to serve as the basis for subsequent studies of tooltip defect pathways… The speed of a calculation and, ultimately, the quality of the calculation for a particular analysis are dictated by the quality of the computers owned by the participants… The use of a survey of representative available computers at the start of a series of quantum chemistry studies can be of great benefit in identifying the constraints a researcher must place on their investigation. In the absence of transition state calculations or MD simulations on larger tooltip frameworks to remove degrees of freedom in some atoms, it is not known how many of these tooltips can be ignored simply for energetic reasons — either due to large rearrangement barrier energies or due to one-step inaccessibility because of the presence of multiple barriers to complete a rearrangement to a predicted minimum. In most stable tooltips, H migration is assumed to be the most accessible route to the formation of inoperative structures (what previous studies [R. A. Freitas Jr., D. G. Allis and R. C. Merkle, J. Comput. Theor. Nanosci. 4, 433 (2007)] have called “hydrogen poisoning”). All of the tooltips in this study are designed to facilitate dimer deposition and tooltip retraction with the only modification to the covalent framework of the tooltip being the loss of the C2 dimer… The defects identified in the NH@H study with broken Ge-Cframework bonds may not themselves be accessible in isolation, but the additional bonding modes and resulting strain in the entire system as part of a mechanosynthetic operation makes such defect modes important in the overall design analysis of a diamondoid structure that is to be fabricated. The formation of broken Ge-C/C=C bond pathologies are noteworthy, both in the context of the operational issue described above and in the manner by which a symmetric bond breaking in these tooltips can produce very stable geometries that then require large transition state barriers to be present for the mechanosynthetic operability of the tooltip. 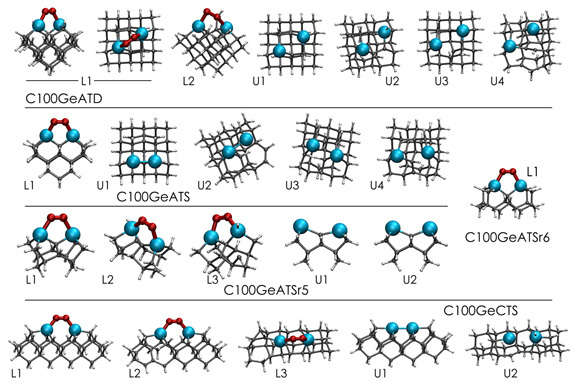 As noted in the Hydrogen Migration section, the formation of these strained bonds in the UT structures may not be detrimental to tooltip operation but may, by increasing the barrier to other defect modes, serve as a form of stabilization during the time between deposition and C2 dimer recharging. 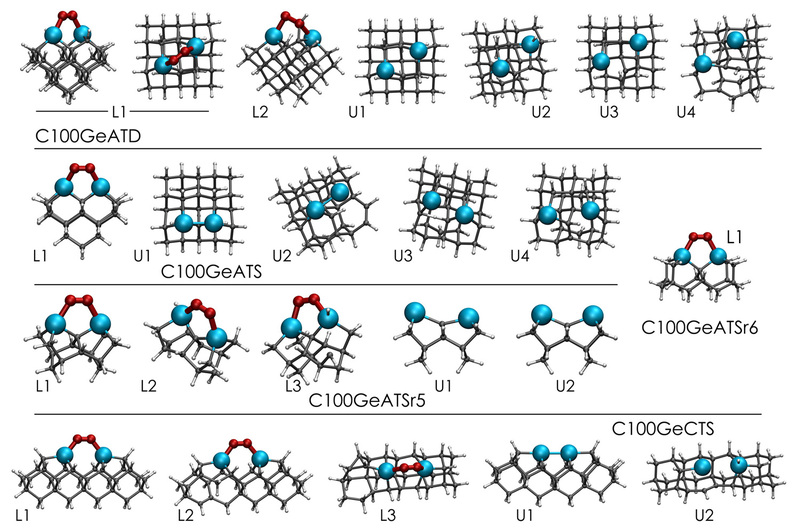 Remarkably, despite the high temperatures and otherwise large deformations identified in many of the tooltip structures, specific structural deformations at the Ge-[C2 dimer]-Ge position were identified in only a few cases from the MD-based quantum chemistry optimizations… Here and generally, both the quality of the basis set and the inclusion of electron correlation (by way of the B3LYP density functional) are expected to make a considerable difference in the accuracy of the estimated relative energies. In most rigid tooltip designs, the identification of conformational minima is interesting but otherwise not of significance, as conformational flexibility at the tooltip base is, like H inversion, removed from all structures as a result of embedding the structure within a larger and more constraining tooltip framework… This approach to tooltip design optimization via conformational control of the base has not been considered in previous studies and is one of the more interesting results to emerge from this initial NH@H study. A few documents from the original website are reposted here in PDF format for historical purposes (providing a bit more context. If you were part of the original @Home crowd and participated in any of the forum discussions, all of the text above likely makes some amount of sense). NanoHive-1 (NH1) is a modular simulator created by Brian Helfrich which is used for modeling the physical world at a nanometer scale. The intended purpose of the simulator is to act as a tool for the study, experimentation, and development of nanotech entities. NanoHive-1 is a GPL/LGPL licensed open-source development – you can download and use it for free. NanoHive-1 can be run stand-alone, or easily integrated to support other applications such as CAD tools. NanoHive@Home (NHAH) is a distributed computing system also created by Brian Helfrich based on the BOINC platform that was used for large-scale nanotech systems simulation and analysis; drawing its computing power from otherwise idle computers sitting in people’s homes. The goal of NanoHive@Home was to perform large-scale nanosystems simulation and analysis that was otherwise too intensive to be calculated via normal means, and thereby enable further scientific study in the field of nanotechnology.